LANDBANK provides capability-building services to Bank-assisted cooperatives through the LANDBANK Countryside Development Foundation, Inc. (LCDFI). Funded by annual donations from LANDBANK, LCDFI covers cooperatives, farmers’ organizations and associations, countryside financial institutions, non-government organizations (NGOs), and foundations nationwide. The training modules by LCDFI are focused on various management and operations of the cooperatives and other CFIs. Further, LCDFI offers entrepreneurship seminars for OFWs and their beneficiaries as well as values/leadership orientation for client members. LCDFI trains bank-assisted cooperatives towards achieving the objective of promoting national food security by increasing agricultural productivity, and increasing farmers’ income by improving efficiency in the food systems. 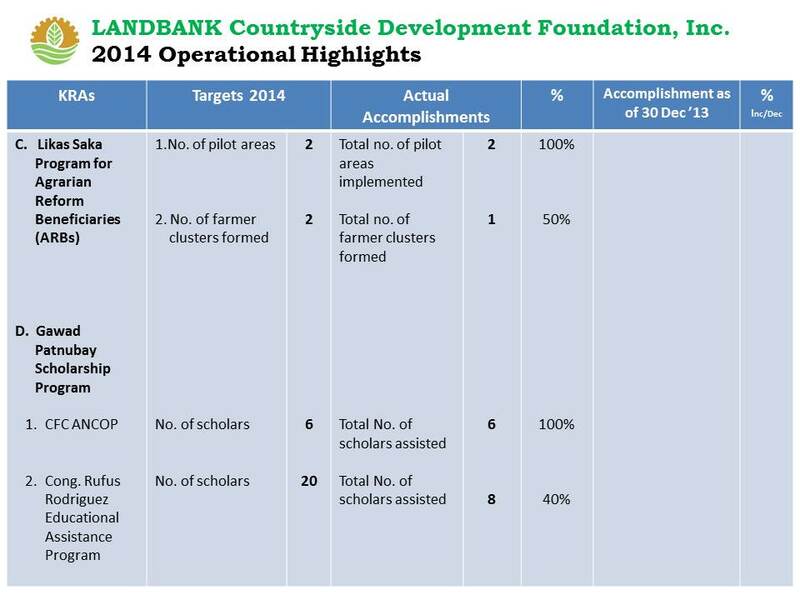 Furthermore, LCDFI provides training interventions to LANDBANK-assisted cooperatives to address their weaknesses as identified in the operations review. LCDFI provide capacity building services to strengthen farmers’ organizations and cooperatives in areas where it is most needed. They also conduct technical capability enhancement trainings to sustain product marketing requirements. The Bank, through LCDFI, also implements a “big brother” training program for selected Key Cooperatives (KCs) with a provision of technical training on a one-on-one basis for coop board, management and personnel. These selected KCs are committed to map out and target small farmers and fishers for membership to the coop of defunct coops. They will also participate in poverty interventions, projects/activities in their assigned coverage of province/s and/or regions. 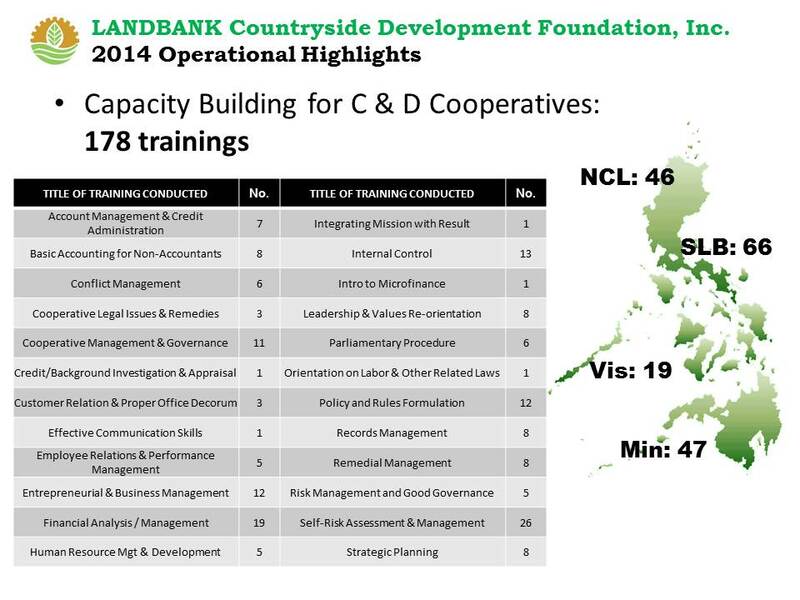 In 2014, LCDFI conducted a total of 178 training seminars for 6,619 members of Bank-assisted Cooperatives with maturity level C & D, which is 111% higher than the target of 160 trainings, and a 14% increase from the 156 trainings conducted in 2013. Of the 178 trainings, 46 were conducted in Northern and Central Luzon, 66 in Southern Luzon and Bicol Region, 19 in the Visayas, and 47 in Mindanao. Meanwhile, the BANGON Mini-Farms Program piloted four (4) sites in Leyte Province that were devastated by Typhoon Yolanda, namely: Capoocan, Tacloban City, Palo and Tabango. Of the five (5) targeted training workshops on organic and natural farming, eight (8) were conducted for 1,620 beneficiaries, which is 160% more than the targeted number of trainings for the year. Moreover, the Program was able to forge a partnership with the Department of Social Welfare and Development (DSWD) under its “Cash for Work and Livelihood Assistance Program” that provided farmers with an initial grant to set-up a mini-farm. For its part, the Department of Agriculture (DA) provided free seedlings and much needed farm equipment. LCDFI continued to assist farmers in setting-up local farmer’s markets to sell their produce, as well as lead the initial talks for an institutional supply agreement with major supermarket chains in the Visayas. In October 2014, the Likas-Saka Program was piloted in two (2) sites, namely in Hacienda Luisita, Tarlac and Bondoc Peninsula, Quezon. Training seminars on sustainable agriculture were conducted, employing local development facilitators to reduce costs. This resulted to the formation of a farmer cluster in Quezon. Meanwhile, two (2) special college scholarship programs were launched under the LANDBANK Gawad Patnubay Scholarship Program beginning 2014. These were the Couples for Christ Answering the Call of the Poor (CFC-ANCOP) with six (6) scholars, and the Cong. Rodriguez Educational Assistance Program with eight (8) scholars, all taking up Bachelor of Science Degrees in Agriculture and related courses.